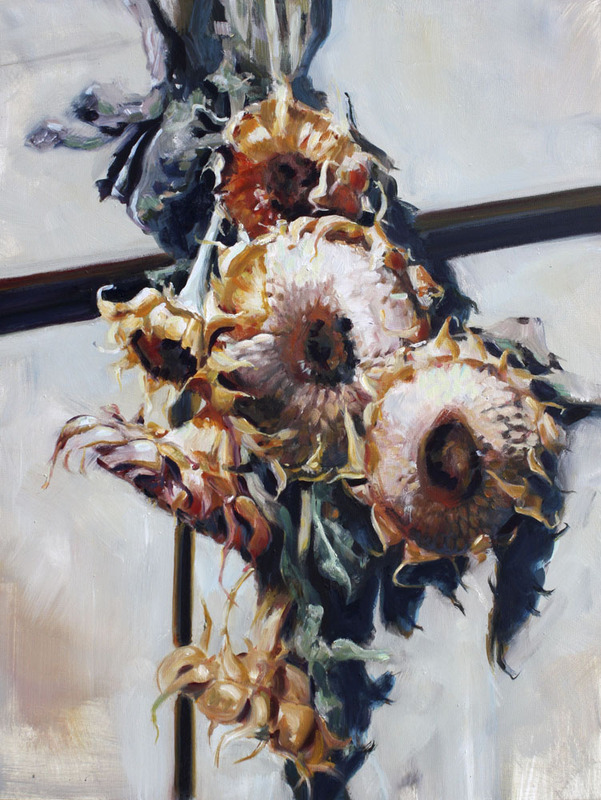 Sunflowers are one of my favorite blooms but I chose to depict them after the bright and apparent beauty of summer had faded into that of a softer and more subtle beauty of fall. All of nature has a beauty of youth, but a different beauty comes with age, and though it is sometimes overlooked, this can be even more beautiful than that of its predecessor. Those blessed enough to experience all the seasons of life are charged with finding and enjoying the beauty in each and in many ways, this painting represents my finding comfort, peace, and beauty with myself, and the changes that mid-life brings. How may one explain one’s inspiration? Flowers themselves are a perpetual inspiration. You have only to look at them to want to caress their shapes and colors with your eyes. And then, being an artist, to caress them with your brush and paint so that you may make a fixed image of their transitory beauty. 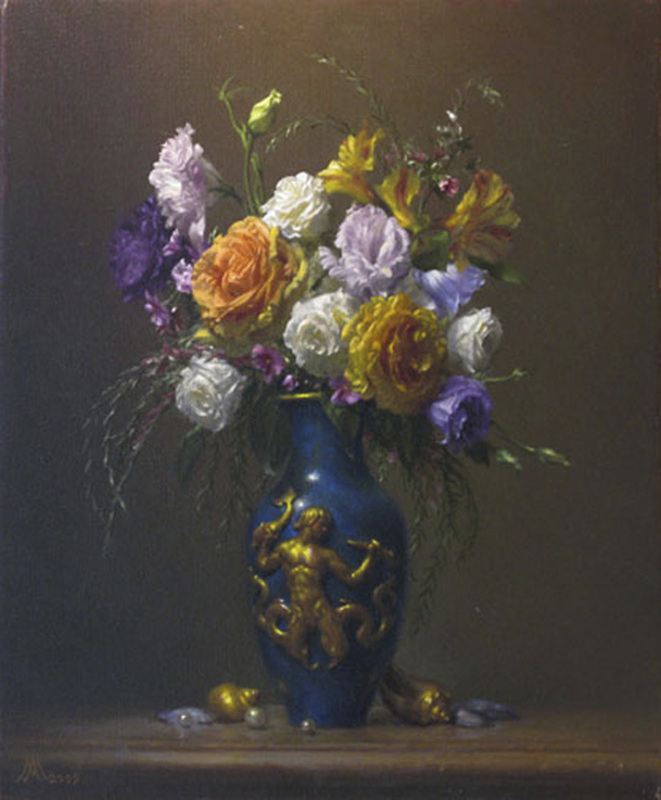 In my painting, the flowers have a soft but bright effect, running a fair gamut of the spectrum in a cheerful assemblage of delicate hues supported by the sonorous deep blue vase with its golden Triton youth. The shells and pearls at the base echo the flowers above. I noticed these bumblebees busily at work one afternoon and was inspired by the dramatic lighting upon them and the thistle. 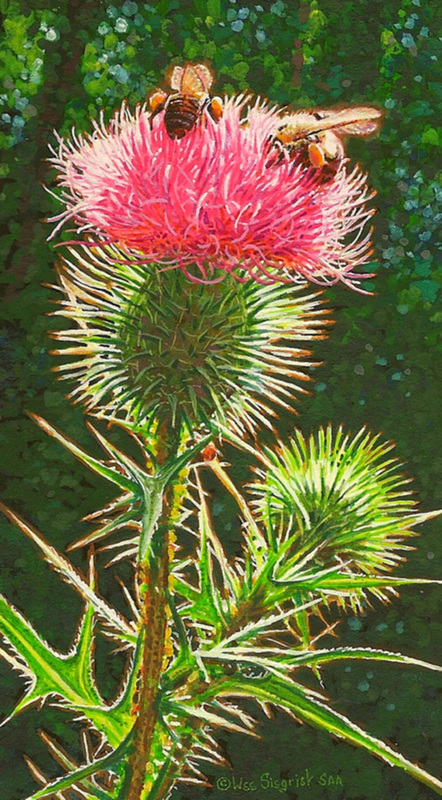 I usually check out thistle plants when hiking as they are almost always hosting some specie of bird or insect. The backlit nature of the subject was especially fun to render. The conditions were excellent this year for the growth of wild flowers in the gently rolling hills between the Gulf Plains and the Texas Hill Country. 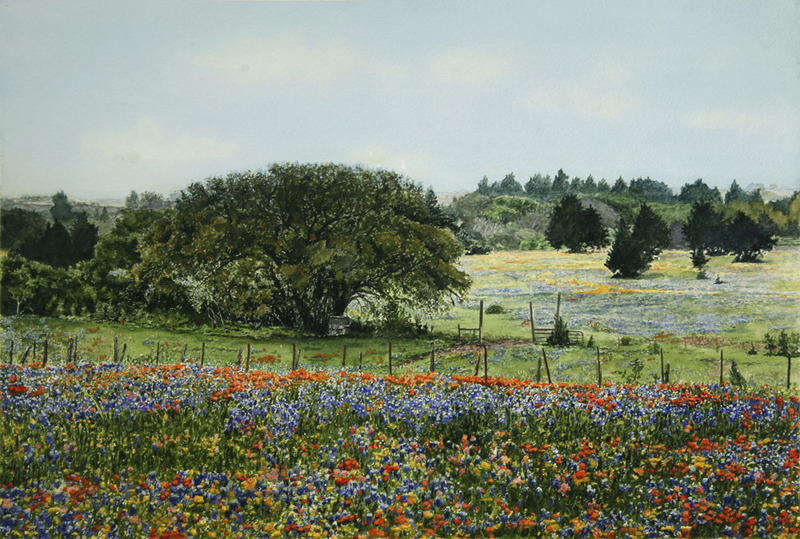 I made several trips to find motifs to paint and I came upon the scene that inspired me to paint “A Texas Treasure”. Although I set out to get motifs of the Texas bluebonnets, I was drawn to the variety of flowers that created a greater spectrum of color. I was also grabbed by the large oak tree beside the dirt path that leads one to the other flowers deeper into the painting. To me, this is a true “Texas Treasure”. Painting people and painting flowers are two of my artistic passions. The open air markets are always a great location to study and capture these subjects on canvas. Most of my clients and students identify my work by my painterly style and the way I flood my subjects in sunlight. These are the most important elements in my paintings. 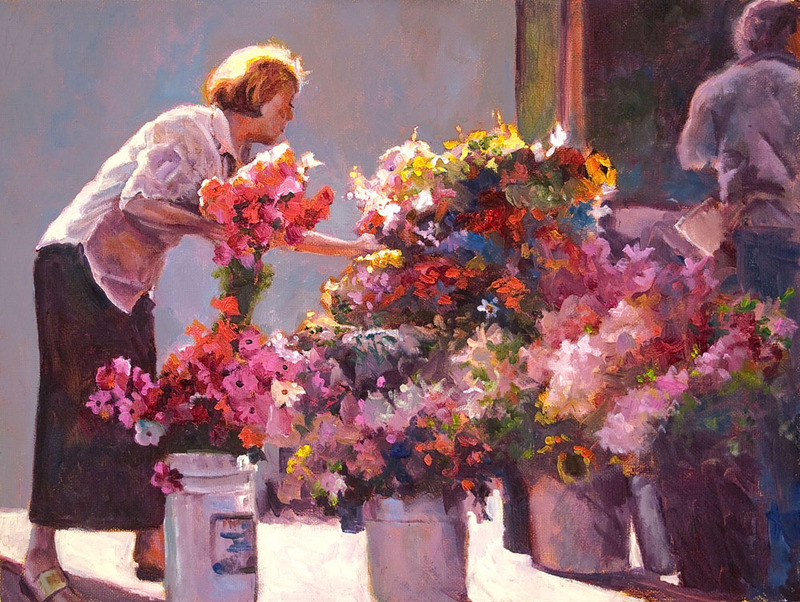 Nothing presents a greater opportunity to paint these qualities than the flower market. This woman selecting her bouquet with the sun illuminating both her hair and the blossoms begged to be painted. I deliberately played down any distracting lights to keep the focal point and composition strong.